PeaZip is an open source file archiver program that allows you to create and edit archives with its attractive GUI. With PeaZip, you can create 7Z, BZ2, GZ, PAQ/LPAQ, QUAD, TAR and Zip and open ACE, ARJ, CAB, CPIO.Z, ISO, LHA, LZH, RAR, Linux (DEB, RPM, PET/PUP, SLP). 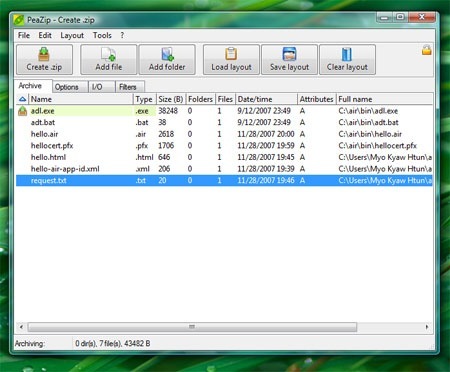 The most I like the features from PeaZip are ultra zip method,spliting feature that create an executable file and split into multiple files that we used to see in WINRAR and GUI. You can use command line to save your time for both extraction and archiving operations. PeaZip is only available for Windows and Linux. This month, October 2007, brought 5,979 unique visitors and hit 16,377 Pageviews (excluding my visits). Alexa stats goes up to 146,015 from around 285,000. And the biggest changing is that this site has PR 5. This October, I created a wordpress theme named Applopress that brought a lot of traffic for my blog. Top referrer sites were weblogtoolscollection, shoemoney (I’m still confused. I did not see any links in ShoeMoney) and clazh. Search Engine were Google and Search.com. I put Google Adsense again in this month and earned $7.24 from Google Adsense (). Thank you for giving time to visit my blog. Stats by reinvigorate.net because I accidentally removed the Google Analytics script in this site while I was upgrading to WordPress.